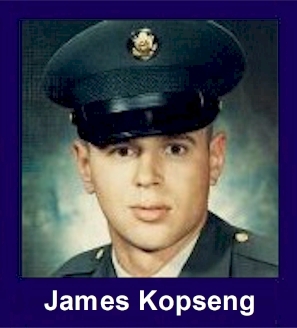 The 35th Infantry Regiment Association salutes our fallen brother, SSG James Claire Kopseng, who died in the service of his country on May 14th, 1969 in Pleiku Province, Vietnam. The cause of death was listed as Booby Trap. At the time of his death James was 21 years of age. He was from Harvey, North Dakota. James is honored on the Vietnam Veterans Memorial at Panel 24W, Line 17. The decorations earned by SSG James Claire Kopseng include: the Combat Infantryman Badge, the Bronze Star with V, the Purple Heart, the National Defense Service Medal, the Vietnam Service Medal, the Vietnam Campaign Medal and the Vietnam Cross of Gallantry with Palm Unit Citation. Jim was an outstanding football player at Harvey High School. He attended UND before entering the service. I remember him well and wonder what turns his life would have taken, if not for Viet Nam. Jim was my best high school buddy. We both lived on farms and would always have a blast getting into town to party and see what kind of trouble we could get in! He was a terrific athlete and the girls loved him! His death left a very large vacancy in my life as well as the world's. I am a better man from having known him in my youth. Rest in Peace, Jim my friend. For heroism in connection with military operations against an armed hostile force in the Republic of Vietnam. Staff Sergeant Kopseng distinguished himself while serving as a Squad Leader with D, 1/35th Infantry. On 14 May 1969, Staff Sergeant Kopseng's unit was conducting a search and destroy operation in the heavily vegetated area south of LZ Charmaine. Staff Sergeant Kopseng was at point of his squad, teaching a new man the fundamental principles of working as the point element. As the made their way through the dense vegetation, a booby-trapped enemy anti-personnel mine was triggered, mortally wounding Staff Sergeant Kopseng. Staff Sergeant Kopseng's outstanding performace, professionalism, and exemplary devotion to duty are in keeping with the highest traditions of the military service and reflect great credit upon himself, his unit, and the United States Army.